• The calcium and magnesium in hard water can inhibit many soaps and detergents by reducing their suds and cleaning capabilities. The soapy residue they form can be abrasive and reduce the life of clothing and linens. • Consumers may notice a film on their bathtubs or shower tiles, even themselves. The film that is left often results in additional scrubbing and scouring of the bathtub and other fixtures. The film that is left on the body can leave the skin dry and hair dull and limp. 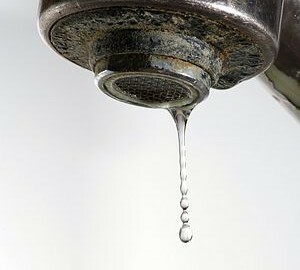 • Clogged pipes and/or appliances could be a sign of hard water. Hard water minerals can form in coffee makers, shower heads and can build up in pipes or plumbing equipment. A consumer may notice a reduced water flow as well as an increase in the amount of calls to the repairman. • Your water heating costs could increase as a result of hard water. When hard water is heated, minerals can precipitate and form scale. Besides buildup, mineral deposits can form an insulation barrier inside the water heater. • The life of the plumbing system may increase because clogging from scale within pipes will be reduced. • Water heating efficiencies on systems using soft water may be increased up to 29 percent if heating with gas and 22 percent with electricity. • Many appliances may last longer and perform better. • Soapy residue on clothes is reduced so they may look and wear better. • Skin and hair can be rinsed more completely making hair look shinier and skin cleaner. • Film on tubs and shower tiles may be reduced, as will scratching to bathroom fixture finishes and sinks. For some consumers, the fact that sodium is used to soften water raises concern about their drinking water and a potential health risk. However, what many people may not know is that when doctors discuss salt and its effects on a person’s health, they usually refer to sodium chloride, not sodium bicarbonate which is the result of softening. Further, according to Dr. Andrew Zweifer, Director of the Hypertension Clinic at the University of Michigan, “Drinking water represents a very small part of sodium intake in most persons. Even water softening systems using salt don’t introduce enough salt to be of concern.” Similar views were expressed in the New England Journal of Medicine and by the U.S. EPA. If consumers do not want to add any additional sodium to their diet, or if they are on a medically prescribed diet, they may choose to connect their water softener to the hot water line only, thus leaving consumers able to drink and cook with unsoftened cold water. Or, better yet, they can install a reverse osmosis drinking water system and have the full benefits of both technologies in their home. Look for the WQA Gold Seal on home water treatment systems. This recognizable symbol gives the consumer the assurance that the equipment has been tested against industry performance standards, has successfully passed these tests, and has been validated for performance capabilities.